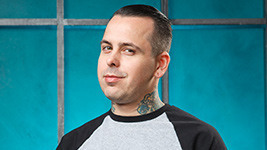 Ink Master | Season 3 | Jime Litwalk. . Wallpaper and background images in the Ink Master club tagged: photo ink master season 3 promotional shoot jime litwalk. This Ink Master photo might contain jersey, camisa de t, t-shirt, t shirt, tee shirt, retrato, headshot, close up, and closeup.